Posted September 5, 2018 by Sara Lander & filed under CITY NEWS. There are many benefits to the much-maligned brightly coloured rental bicycles strewn everywhere. They’re cheap, reliable, convenient and useful if you need to commute a short, relatively flat distance in an area where parking is limited and public transport expensive. They also reduce traffic congestion, encourage people to exercise and are a great substitute if you wish to avoid leaving your own bicycle somewhere vulnerable to theft. They’re especially popular among tourists and beach-bound backpackers. And yet it appears Australians prefer to ruin rather than ride these machines, and otherwise won’t touch them with a barge pole. Here in Sydney, dumped rental bikes are frequently exposed at low tide rusting in mud along the Alexandra Canal and Cooks River, and there are countless photos on social media of them hanging from trees or piled up in parks, their wheels typically buckled. Until recently there were five rental bicycle companies operating in Sydney: oBike, Ofo, ReddyGo, Mobike and Riide. Unlike traditional hire bicycles, which must be returned to a dock after use, ‘dockless’ rental bikes are unlocked by a mobile phone app and can be left at their destination. This means users can effectively abandon them anywhere. Although only launched in mid 2017, within weeks of their arrival the bikes began piling up in popular tourist spots, clogging footpaths and beaches and creating a trip hazard for the visually impaired. By August Sydney Harbour Foreshore Authority rangers began impounding them. “Allowing a free-for-all with no allocated parking or protections for residents will only result in the industry losing popularity and patronage,” he declared. In January 2018 a coalition of six Sydney councils – Canada Bay, City of Sydney, Inner West, Randwick, Waverley, and Woollahra – imposed strict new guidelines to ensure the rental companies met a set of regulations to reduce the number of abandoned bicycles. Waverley Mayor John Wakefield then called on the New South Wales Government to close a legislative loophole that allows share bike companies to operate without a permit. In March 2018, Waverley Council undertook two major collections of damaged, non-operational bicycles in their jurisdiction. This robust administration probably precipitated the end of rental bicycles’ anarchic reign. In July this year, two of Australia’s main players, Chinese-founded Ofo – the ubiquitous canary-yellow brand – and its Australian rival ReddyGo – candy red – announced their intentions to abandon business here. Ofo, one of the world’s most successful bike-share companies in a saturated market, is in jeopardy. The Beijing-based bicycle behemoth reached its peak in 2017 when it deployed over 10 million bicycles in 20 countries and 250 cities. The company was valued around $2 billion, leasing bikes to over 62.7 million monthly users. In a massive restructuring Ofo has scaled down significantly to consolidate their operations in countries more responsive to bicycle hire than Australia. Australia has one of the poorest uptakes for rental bicycles; share bikes in Sydney are used, on average, 0.3 times per day, compared to 2-6 trips per day in other countries. Unlike Ofo, which can retreat to its Beijing base, ReddyGo has limited options. 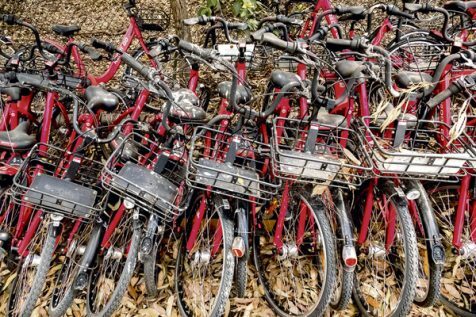 Hundreds of bicycles still languish at their Alexandria depot, many unused since ReddyGo’s Sydney launch in July 2017 with a promise of ‘6000 bicycles by Xmas’. City Hub visited the compound and found dozens of bikes in states of disrepair and dismemberment. Despite this, ReddyGo, founded by UTS graduate Donald Tang and backed by a large Chinese app developer, still offers bikes for $1.99 per half hour hire. The ReddyGo app remains available to download online, where many frustrated users complain about a myriad of issues. City of Sydney Council is skeptical about ReddyGo’s imminent departure. A spokesperson told City Hub, “We haven’t heard that ReddyGo is leaving Sydney. The media reported this following oBike announcing their departure from Melbourne. As far as we know they are still operating. ReddyGo didn’t respond to repeated requests from City Hub to comment.